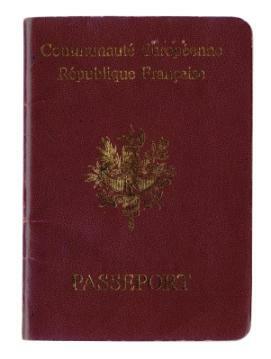 The French passport bears one French emblem on its cover. France has many French emblems that are considered "official." From the fleurs de lis to the Marianne, each French emblem has its own unique history and uses. You've come to the right place to find out more about the French emblems. The official identifier of France was adopted in 1999. Marianne, which personifies the Republic has a white profile in the middle of a blue stripe and a red stripe, making up a sort of tricolor with France's motto, égalité, fraternité, and liberté written underneath. This is the official symbol of the French government. Before Marianne, there was another emblem that is still seen on older passports and other official buildings. The emblem has a laurel branch for the victory of the Republic, an oak branch symbolizing wisdom, a fasces which is associated with justice and a wide shield with a lion head that bears the initials RF which of course stand for la République Française. Le coq galois, or Gallic rooster, was a symbol of France during the French revolution and could be seen on the national flag at that time. At one point, the rooster replaced the fleur de lis, but was rejected again by Napolean III. The rooster frequently adorns old churches in France, it is sometimes on postage stamps, and it was also on a coin. It is currently the French emblem on the uniform of all international sports teams. The fleur de lis is a classic French emblem and at one time the French flag carried the fleur de lis. It is still seen in France and although it was incorporated into the coat of arms of many European countries, it is still considered a French emblem. While the official emblems have changed over the centuries one thing remains the same. France takes great pride in its national symbols and goes to great lengths to protect its emblems, their history and the cultural heritage. You can seem French emblems in many places throughout France.